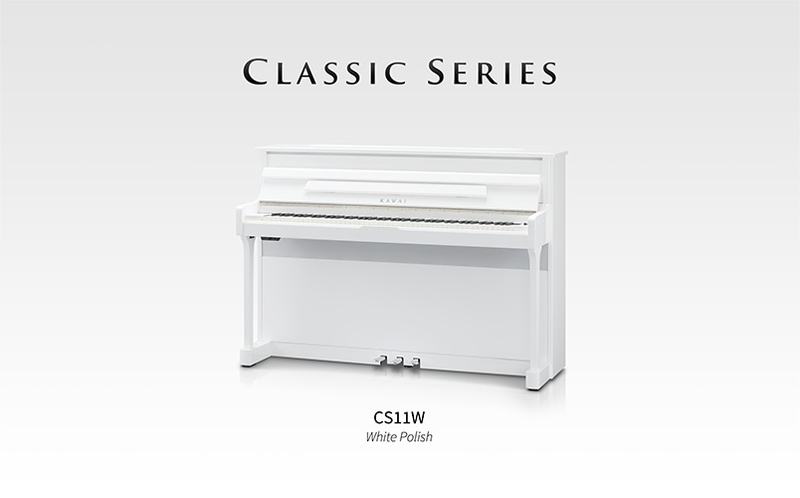 Kawai Japan is excited to announce the CS11W, the latest addition to the Classic Series range of luxury digital pianos, and the first Kawai digital instrument to be presented in an elegant white polish finish. First unveiled in 2011, the Classic Series range of high specification digital pianos combine Kawai’s leading keyboard action and piano sampling sound technologies, with stunning polished cabinet designs that raise the artistic aspirations of the performer. Modelled on the appearance of a Kawai K Series upright piano, the CS11W is the perfect instrument for pianists who appreciate the benefits of owning a digital piano, yet still admire the understated character of a truly classic design As the top model of the Classic Series range, the CS11W features Kawais finest Grand Feel II keyboard action with extended-length, fully wooden keys and Ivory and Ebony Touch key surfaces, while its expressive Harmonic Imaging XL piano sampling technology reproduces the beautiful sounds of the Shigeru Kawai SK-EX, SK-5, and Kawai EX acoustic grand pianos with stunning authenticity. In addition to its realistic keyboard action and sound technologies, the CS11W also offers a variety of convenient digital features accessible from the instruments cheek block control panel. However, this panel can be easily concealed when not in use, thus preserving the CS11W’s acoustic piano-like appearance, and allowing performers to enjoy the simple pleasure of playing music without the visual distraction of flashing lights and rows of buttons. The original black polish CS11 is widely considered to be one of the most beautiful digital pianos available. We received many requests to develop a white polish version of the instrument, and we’re confident that this elegant new finish will prove popular among customers with lighter home interiors. The CS11W is scheduled for initial release in Europe from September, with other regions to follow shortly after. Kawai is a global corporation with distribution in virtually every major market in the world. From its beginnings in 1927 in Hamamatsu, Japan, the company has been committed to an ongoing quest to perfect the art of the piano. One of the world’s largest music instrument manufacturers, Kawai celebrated its 90th anniversary in 2017 and is one of the few piano companies still led by members of its founding family. GUESS WHAT IT IS THAT TIME OF YEAR AGAIN, THE KAWAI EOFY SALE !!. Hurry in for End Of Financial Year reductions on brand new Kawai upright, grand and digital pianos. All with full Kawai factory warranty. You get a super new piano at a bargain price, and we clear our warehouse for a new financial year. Sale ends 30 of June so get in fast for some great Deals. Every Kawai grand piano is a symbol of our commitment to the art and science of bringing music to life. For more than 85 years, we have remained at the forefront of piano design and manufacture, introducing materials, technologies and design elements that have set the benchmark across the industry, and across the world. After spending many years in the Australian Piano Industry and successfully managing major piano retail stores in NSW and Queensland, a well respected Piano Technician Ray and his wife Margaret established Carlingford Music Centre in 1982. Since then it has grown to become one of Australia’s longest established Quality independent Kawai Piano Dealerships and Music Stores. Our Guitars Store has a huge range of Cole Clark and Maton Acoustic Guitars, plus a great selection of Brass, Woodwind and String Instruments. And now with over 90 000 Print Music Titles in store and online, we have Australia’s Largest range of sheet music.